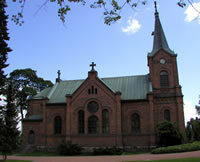 Local Church - Jyväskylä's church played host to the kantele concert. Note that unlike an English church the tower is over the entrance - the pupit is at the other end. They Get Everywhere - Finland is not immune from the plague of McDonald's. So Do They - Or the plague of Irish Pubs. 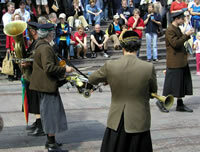 Funny Frenchmen - Auprès de ma Blonde entertain the crowds with their own brand of street music. 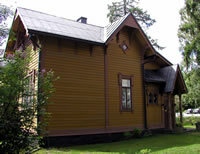 Wooden Houses - There is plenty of wood in Finland, so most older houses are built with it. Lakeside - Like most Finnish towns, Jyväskylä is built on a lake. Writers' House - This is where I stayed during the convention. 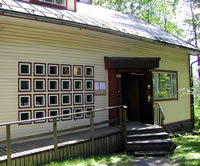 It is a city building used by the Writers of Central Finland. Every year around 6,000 people visit it for various events. 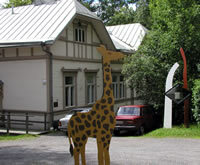 Artists' House - Next door is a similar house for visiting artists. Sadly I never managed to get a look at the gallery.